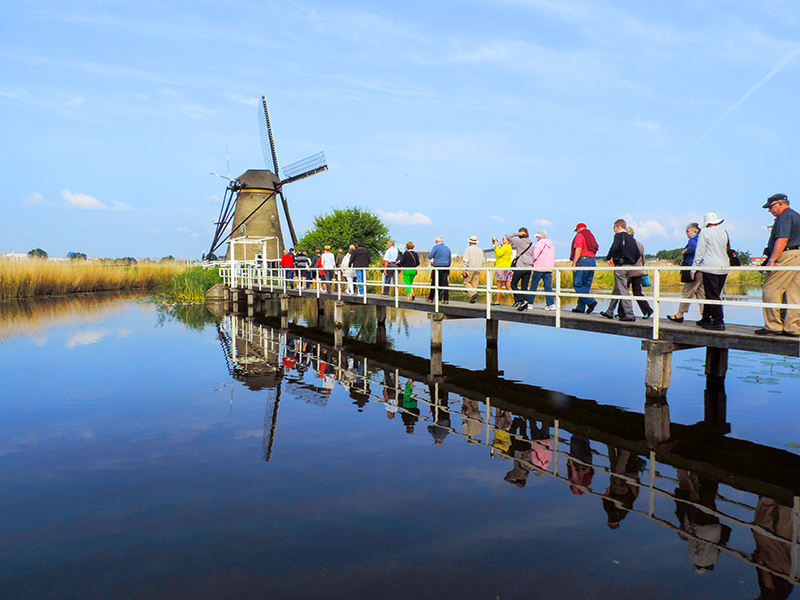 With its iconic windmills, tulips and canal-laced cities and countryside, The Netherlands has been a favorite of travelers for decades. Most travelers, however, make a beeline for Amsterdam and, perhaps, a few smaller towns outside the capital. 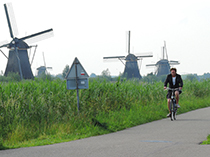 The more adventurous go further afield to such rewarding destinations as Rotterdam and Utrecht to the south. But outside major Dutch cities there are wonderful experiences to be found in the countryside. Here are two of them in southern Holland, each only a half-hour outside of Rotterdam. I had been to Delft some years ago when on a trip to Holland I took a side trip there after deciding I wanted to buy a piece of antique Delftware. I purchased a plate that was created circa 1720, and I remember sitting on the curb in front of an antiques shop waiting for it to open. I went back to Delft a few days ago, not to buy another, but because I remembered it being such a charming little city. It turned out to be better than I remembered. Delft is a delightful Dutch town with old brick buildings, brick streets, brick sidewalks and more bikes than you can count. 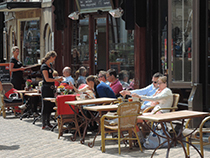 Like many small Dutch cities, it’s a quiet place that beguiles you with its shops, its cafes and restaurants and centuries of culture that beckon from all over town. I entered the old historic part of the city by walking down Nieuwe Langendyk, a pretty street with sycamore trees on an island in its center shading the tables and chairs that spill out from the cafes that line it sidewalk. 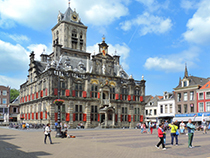 The street flows into the city’s large and attractive Markt Square, which sits between the bookends of the old Nieuwe Kerk (New Church) and the ornate and beautiful city hall. 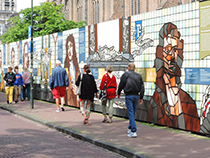 The church is being restored and I was delighted to see a 12-foot fence around it showing an artistic rendering of sections of its historic stained-glass windows with commentary in both Dutch and English explaining the story behind what was being depicted in different panels. It was a fascinating history lesson, one of the most interesting and colorful I’ve see anywhere in the Netherlands. I found Delft’s Tourist Office right around the corner on the left side of the church. The woman there was very helpful in taking the time to mark everything on a map she thought I’d be interested in seeing. The office also had an ingenious kiosk that superimposes your photo on your choice of a Delft plate, tile or postcard, all at a cost, of course. She suggested two small museums she thought I’d be interested in seeing – the Prinsenhof & Sint Agathaplein Museum (across from the Oude Kerk several blocks further on) and the Museum Paul Tetar van Elven – both of which I certainly wanted to visit. But since my time in Delft was quite limited I decided instead just to rove about Markt Square and poke into various shops before wandering about the old city aimlessly for an hour or two, which turned out to be quite enjoyable. For someone with limited time it turned out to be the best thing to do. It was a beautiful early June morning to be in Kinderdijk, one of Holland’s picturesque UNESCO World Heritage sites, where 19 centuries-old windmills still grace the polders southeast of Rotterdam. In fact, it’s the only place in the world where so many windmills stand so close together in an authentic polder landscape. When I arrived about 8:30am I found two river-cruise boats had arrived earlier and passengers were already gathering onshore for a walking tour of the area. I quickly parked my car and headed right into the site, beating the crowds. Within minutes I had the place to myself except for an occasional bicyclist, two fishermen and, later, a group of amiable rollerbladers. The sun was still low in the sky so it wasn’t yet hot and several geese with their goslings glided across the still water. The only sounds I could hear came from the geese and an occasional duck in the reeds along the water’s edge. Along the path of the canal thousands of white daisies had burst into bloom; in the water white and yellow water lilies would do so in another day or two. I couldn’t think of a better place to be spending a quiet Sunday morning. The beauty of the surroundings not withstanding, Kinderdijk also has great historic significance since its mills were part of an inventive pumping and water-management system that actually created the Holland we know today. 17 of the mills were built between 1738 and 1740, the other two years earlier, and many are now used as homes. 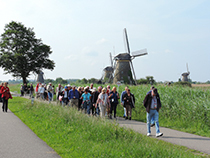 Tourists can only visit the Windmill Nederwaard, a few hundred yards from the entrance. Although around 9am tour buses began arriving, bringing in more visitors, everything still remained relatively tranquil. But even when the tour groups arrive if you continue walking further past Windmill Nederwaard you can find even greater tranquility. Or even better, arrive between 8 – 8:30am as I did, and you’ll find few, if any, distractions. I found the small museum across the canal not really interesting at all since it only contained a “workshop” in which group tour guides gave demonstrations of how the windmills worked. The adjacent “museum” only contained a few artifacts of passing interest. Although I would have welcomed some exhibits that had more depth, it didn’t deter from my visit to this beautiful place. It’s iconic Holland, perhaps more so than any other place in the country.